Radish greens stir fry is a crunchy, flavourful dish made with sautéed radish leaves, chopped garlic and topped with grated coconut. Andhra Mullangi Aakula Vepudu with aromatic radish leaves is an easy and quick poriyal recipe. Radish greens are called Mullangi Aaku in Telugu, Mullangi Keerai in Tamil and Mooli ke Patte in Hindi. 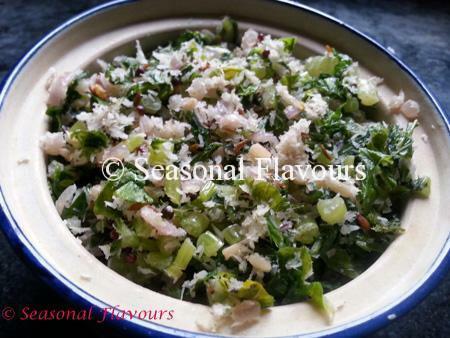 These delightfully edible and tasty radish greens, cooked crisp-tender with a sprinkling of grated coconut, will surely turn you into an avid radish greens fan. Who knew you could eat radish leaves! Radish leaves are rich sources of protein, calcium and Vitamin C. They are effective in treating jaundice, kidney & skin disorders and fighting cancer. In India, cooked radish leaves (mooli ke patton ) is quite a popular dish. Mullangi Keerai Poriyal with tender radish greens, mildly spiced and topped with grated coconut goes well with Dal-Rice. So next time you lay your hands on a nice fresh bunch of tender green radish leaves, don’t throw them away, but try out this easy radish recipe. Just slice them up and sauté them with some chopped onions, garlic and red chilli and garnish with grated coconut – serves as the perfect side dish for any meal. To make Radish Greens Stir Fry, chop radish leaves, onions and green chilli. Coarsely pound cumin seeds and grate the coconut. Heat oil in a pan. Toss in broken dry red chilli, urad dal, mustard seeds and asafoetida. Saute for 30 seconds. Add garlic, onions and green chilli. Fry till the onions turn pink. Add the mullangi aaku and salt. Mix well, put a lid on and cook till done. Add freshly grated coconut and coarsely pound cumin seeds. Give a good stir and remove the mooli ke Paaton ki Sabzi. Serve Radish Greens Stir Fry with Rice and dal. If you are looking for more leafy greens recipes, do try out Neem Begun and Curry Leaf Chicken. Radish Greens Stir Fry with tender, vibrant green radish leaves (Mullangi Aakulu) packed with nutrients makes for a healthy treat. Mullangi Keerai Poriyal makes for a perfect side dish with Rice and Dal. Wash and thoroughly clean mooli leaves and chop finely. Finely chop the onions and green chilli. Grate the coconut. Pound cumin seeds coarsely in a pestle and keep aside. Add oil in a pan. When hot, add a broken red chilli, urad dal, mustard seeds, hing and fry well. Add garlic pods, sauté, add onions and green chilli, fry for a couple of minutes till onions turn pink. Add radish leaves and salt and cook covered till done. Add grated coconut and crushed cumin seeds, combine well and remove. Serve Mullangi Keerai Poriyal with Rice and dal.